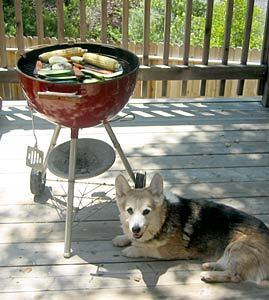 Here is a cute Corgi news item from Montana. While we were at the park by the river, some ducks made threatening moves toward Daisy. She had waded into the water for a swim, and I guess she picked a spot a little too close to the ducks’ favorite area and they got a little territorial. I was safely onshore, but Daisy was completely oblivious to their warnings, and continued to enjoy her swim. The ducks got closer and louder. Finally, Daisy did her shake and got out of the water (yes, in that order—Daisy has not quite figured out that the purpose of shaking is to get the water off, and that is best done out of the water) and the ducks called a retreat. It was kind of funny though—I noticed that the ducks had a lot more courage while Daisy’s back was turned. I guess these ducks were chicken. Hey, that was kind of funny. 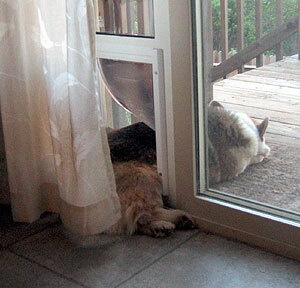 I believe I have discovered a convenient way to get a little fresh air while retaining the comfort of the indoors. Either I am very clever or this is the height of laziness. 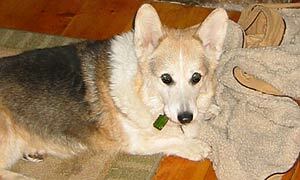 My blankie and a Greenie. But I am on guard. I will be the first to know.